A Look at Goblin Sligh in 2002. This article was originally published on December 24, 2002 on the now-defunct MTGPlanet.com (conveniently archived by the Internet Wayback Machine). First of all, for those of you who don’t know me (which would be pretty much everyone, as this is my first article on a MTG website), my name is Joe Pasco and I’ve been playing Magic on and off since Revised Edition. 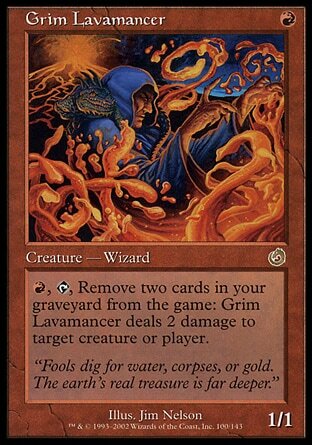 While I started off playing green, I was a red mage through-and-through by the autumn of 1997, when I built my first Sligh deck (I had never heard of “Sligh” then, I just called it a “Direct Damage” deck—but my friends who could rarely win against it called it “The God Deck”). I stopped playing for about 2 years after that, returning for Urza’s Destiny and Mercadian Masques, and after that I stopped playing MTG until the release of Judgment just a few months ago. With all the Wurms and Mongrels running around (or should I say “flying around”? ), I was too distracted to even think about playing red (summer just brings out the green mage in me). I hadn’t played a Sligh deck since 1997 and honestly, I missed it. Since I play mostly Type II, I decided that I’d try to build a viable T2 Sligh deck that could romp with the rest of the big decks out there right now, and hopefully smash some face a good percentage of the time, too. After browsing some forums and getting some ideas, I came up with a new T2 Sligh deck based around—what else?—Goblins! The release of Onslaught in early October brought us some premium goodies as far as Goblins go: Goblin Sledder, Goblin Taskmaster, Goblin Piledriver, and Goblin Sharpshooter. Brightstone Ritual, Skirk Prospector, and Goblin Pyromancer didn’t look too bad either. 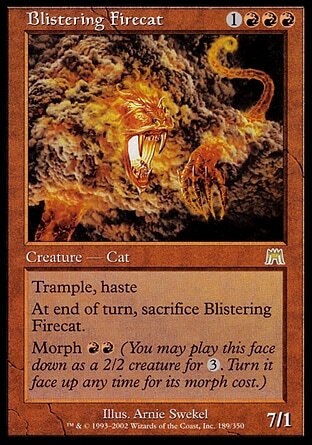 Of course, though not a goblin, I can’t forget about everyone’s favorite new reason to play red: Blistering Firecat. I decided against using Goblin Pyromancer, Brightstone Ritual, and Skirk Prospector. The Goblin Pyromancer is just too slow, and odds are that if you’ve got that many goblins on the table, you’re winning anyway. As for the Ritual and the Prospector, first of all, they work against each other. Sure, you could add Blaze to the deck, cast a Brightstone Ritual and then sac all your goblins to power up a huge burn spell, but that’s just too risky. Other than that, there just aren’t that may times when this deck needs extra mana; it’s a cheap, fast, aggressive deck, and while these cards could speed it up, it wouldn’t be until later in the game when it’s really not necessary. There are better, more aggressive cards to be played. Raging Goblin: Nearly always what you want to cast on turn one. Usually draws first blood. Also good on turn three if you’ve cast a turn two Goblin Piledriver. Goblin Sledder: One of the best goblins ever. This guy totally messes with your opponent’s “combat math.” Also great when combined with Goblin Sharpshooter. Goblin Taskmaster: Another one-drop goblin to boost your Goblin Piledriver, he can also Morph and can pump any goblin for 1R. 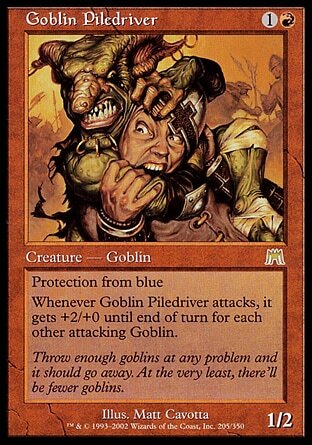 Goblin Piledriver: Your key goblin, this guy is capable of dealing massive amounts of damage unexpectedly during one turn. Combined with Reckless Charge and some other attacking goblins, he can be better than a Blistering Firecat. Sparksmith is amazing. His key role is to clear the way for your Goblin Piledriver so that you can get in that maximum amount of damage. 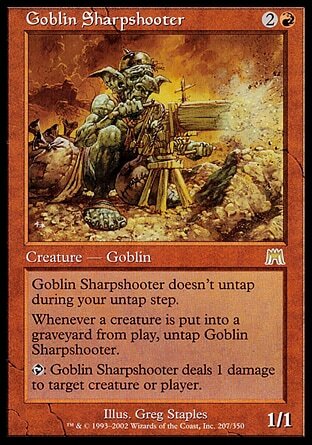 Goblin Sharpshooter: Probably the most fun card to play in this deck, depending on the situation. Any creature on the table with a toughness of 1 can just start making funeral arrangements once the Sharpshooter is active. Never has your wrist gotten such a workout (well, maybe not never): “Shoot your Grim Lavamancer, untap, shoot your Voidmage Prodigy, untap, shoot your Basking Rootwalla, untap, shoot your Merfolk Looter, untap. What’s that? A Blistering Firecat? Shoot it with my Sharpshooter, untap.” Ridiculous. Blistering Firecat: Do I really need to explain this guy? His only drawback is that in a deck meant to be as aggressive as this one, waiting until the 4th turn is sometimes too slow. Nevertheless, this guy is almost ALWAYS trouble. Reckless Charge: A key card to the deck, this card allows you to attack on turn three with a Goblin Piledriver and up to 3 other goblins for up to 13 damage on one turn. Four copies is a must. Lava Dart: Protection against any 1-toughness creatures such as an opposing Blistering Firecat, the Dart can also be flashed back by sacrificing a mountain if you’re in a pinch. Believe it or not, this card has won me games more than I ever would have thought. Violent Eruption: Four Instant-speed damage divided however you choose; with a Madness cost of 1RR, to boot. A great finisher or sometimes a board-clearer to make way for a Goblin Piledriver & friends. Goblin Burrows: A tribal land that speeds up your deck even more by giving your goblins an extra +2/+0 boost. Not a great card to draw on your first turn, but nevertheless it can be very helpful in allowing you to win the game before your opponent can gain any sort of board control. Fetchlands (Wooded Foothills, Bloodstained Mire): If you haven’t ehard how great these guys are, I advise you to check them out. They’re great for thinning your deck so that you draw your business spells instead of land. They also help stabilize your mana base and allow you to include cards like Naturalize, Tranquility, and Smother in the sideboard. Naturalize, Tranquility: Enchantments and artifacts like Engineered Plague and Caltrops can shut down this deck—these two sideboard goodies are how you prevent that from happening. Seven cards to deal with enchantments/artifacts might seem excessive, but two of the most dominating decks are named after the enchantments that they’re based around: Mirari’s Wake and Astral Slide/Lightning Rift. Enchantments such as Oversold Cemetery aren’t all that great to be sitting across the table from either (especially when you’re using a Sparksmith to send creatures to the graveyard and your opponent just keeps pulling them back out). Smother: There are just too many creatures running around in the metagame that are prime targets for this card. Against U/G Madness, you’ve got their Wild Mongrels and Wurm tokens taken care of; Psychatog is history; and face-downs like Grinning Demon and Exalted Angel will have to be hard-cast to get past this card. two (or maybe even two goblins on turn two, if they’re both one-drops—which is very possible with this deck, considering that there are 12 one-drop goblins), and then on turn three you explode with a Goblin Piledriver and a Reckless Charge on the Piledriver, attacking for up to 13 damage on turn three. This is the optimum situation of course, but it can happen (in fact, it’s much more likely than a lot of other Type II combos out there right now). A very wise Sligh player once said, “if you’re blocking, you’re losing.” That’s definitely the case with this deck. The important thing is not to deal with your opponent’s threats, but to deal with your opponent’s answers to your threats. Cards like Engineered Plague, Caltrops, and Circle of Protection: Red are all defensive cards that are trouble for your deck, but if you’ve got ways to deal with them, it forces your opponent to find another way to deal with your threats. This is obviously where the sideboard comes in. Naturalize and Tranquility are fantastic ways to get rid of cards like E. Plague and Caltrops. Your opponent probably sideboarded those cards in on game two to deal with the massive amounts of goblins in your deck, so chances are they’re not running 4 of them. If you can get rid of what they’ve got, they’re left with little defense. This enchantment-hate is also vital considering the current metagame. If your opponent’s Wake deck can’t keep a Wake in play, or if you can keep Astral Slide and Lightning Rift off the table, Goblin Sligh will have no problem beating your opponent senseless while his life total drops from 20 to 0. Grim Lavamancer is just too good to not include in this deck; previously being so focused on goblins caused me to overlook the quality of this guy. A Shock every turn? Fantastic. Grimmy also has great synergy with the fetchlands. At first, I thought Firebolt might be too slow, considering that it can only be cast on your turn. However, there’s enough Instant-speed burn in the deck to protect you on your opponent’s turn; also, if the game ends up lasting longer than expected, Firebolt’s flashback ability can help you end the game where Shock was not able to. As far as the sideboard goes, two of each basic land (2 Swamps, 2 Forests) was just unnecessary; one of each is plenty. Despite the enchantment-heavy metagame, 7 cards in the sideboard for a deck that is supposed to be aggressive is just too much. After having removed two of the basic lands from the sideboard, cutting 2 Tranquility now makes room for 4 Goblin Sharpshooters. I’ve seen some other similar decks using cards such as Barbarian Ring and Volcanic Hammer in the maindeck, and Threaten in the sideboard. You can give those cards a try if you want. I don’t like Barbarian Ring because it relies on having threshold, and while you’re putting tons of cards in the graveyard, you’re also removing them with the Grim Lavamancers, so threshold is just not very likely. That in addition to the fact that you’re probably taking a reasonable amount of damage from the fetchlands and I say Barbarian Ring is just unnecessary. As for Volcanic Hammer, it’s just more burn; if you can find room, I say go for it. I just like Instants better than Sorceries (don’t we all?) so I’d rather play with Lava Dart and Shock, and use Firebolt as my only Sorcery-speed burn. Threaten, on the other hand, is definitely worth trying. I haven’t tested it yet as I can’t seem to find room for it, but with all of the wurms hitting tables, being able to steal one for a turn can probably win you the game. Too bad it’s not an Instant; it would be great to be able to steal an opposing 6/6 wurm to use as a blocker, perhaps getting rid of two creatures at once. Regardless, it’s worth a shot, especially if you’re used to seeing a lot of creatures on the other side of the board. Thanks for reading my first MTG article. Any comments are welcome and very much appreciated. I’m always willing to hear someone else’s opinions, so feel free to send me some constructive criticism.